Here They Come! It's The Sensational!! If Dave Grohl was able to write more songs when he was in Nirvana. A legend out of the glory days of Rochester’s music history is back to puzzle its fans with one of the strangest musical paradoxes of all time: a retro record that is perpetually poised on the cutting edge, like a frozen waterfall. 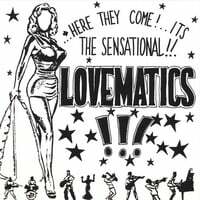 CMI Records is slated to reissue the only CD produced by The Lovematics, one of the leading rock acts to come out of Rochester in the ‘90s, within the next month. The self-titled debut was originally released in 1994 when its lineup consisted of drummer Steve Cavatassi, guitarist Todd Dentico, Bassist Chris Kemp and visionary band leader Paul Morabito, who handled lead vocals, rhythm guitar and all of the songwriting duties. It was in that last role that Morabito defined the band’s groundbreaking sound. The catch is that when the Lovematics were at their peak, Weezer had yet to emerge from obscurity and the Foo Fighters hadn’t even formed yet. The record was more experimental then and ahead of its time by about five years because a heavier style of grunge dominated the national music scene then, according to Mattock. “Back then it didn’t make as much sense,” he said. Because of a few unfortunate missed opportunities commercial distribution was limited to just a few outlets in the Rochester area, which is a tragedy CMI intends to rectify. Despite the limited distribution the nine-song CD still sold well, in part because The Lovematics were one of the leading acts on the club circuit during the “golden years of Rochester music,” when it didn’t take major nationally acts to fill up places like Water Street Music Hall. That does not mean the band was restricted to the Rochester area. The band was expanding its reach until its breakup in the mid-‘90s and was even invited to play at one the most hallowed clubs in rock history, CBGB’s in the Big Apple, which was used as a launching pad for such famed acts as Blondie, The Ramones and Talking Heads. The Lovematics even received a brief mention in a recent documentary on efforts to save the historic bar, Mattock said. No live tour is planned in support of the CD, but if interest in the band remains high then CMI Records might release some of the previously unheard Lovematics tracks in its archives, he said.